Railway is still one of the most popular and even most used means of transportation in Indian. Millions of people travel in train each day, no matter whether they are rich or poor, student or office person. One of the major reasons is that, it is very cheap, safe and fastest way to travel from one place to another. Though I had traveled very less in trains but sometimes its very good for long journey. Before going to anywhere, you should know about the correct train you've to pick. Now let me ask you one simple question. What will you do to find any train time-table like its timings and station points? Will you get these information from Internet? Yeah, it is great thing but the problem is, you should have proper internet connection and if you're in remote area, you may find it hard to access your mobile Internet. On the other hand, online websites are very slow to load and rarely, they provide correct data. So I personally find them useless. Apart from this, you can contact your nearby railway station to get all train updates. But again, in most cases, railway station workers are very lazy or they may not pick up your call otherwise, they will mis-guide with no proper solution. Now imagine how it would to get all these trains information in your Android phone and that too without accessing Internet means even when you're offline. Sounds good? Hmm. This thing is possible. 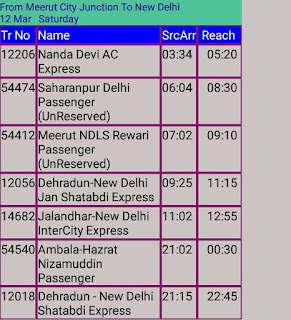 Few days back, one of my friend suggested me to use RailTime Android app and when I installed it for the first time, I was really amazed with the features it offer. 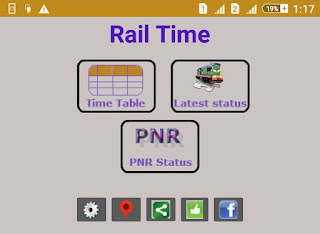 This app may be helpful to you or for other people's who are looking for Indian railway information and that's why today I am going to review this app. Now lets start from basics. You can easily download/install this app from Google play store. It is around 305KB in size which is very less. Even after installing, it will hardly occupy 1.5 MB size in your phone memory. I think you don't need any explanation on how to install it on your Android phone. After getting into app, you've to download the database. Database here means all time-table which includes information like stations, trains name & code, timings etc., Once downloaded, this database will be saved in your phone memory and only after that, you can view any train time-table even when you're offline. Without database, this app is nothing. So basically, it is the soul of RailTime app. One more important thing is that your current database may expire after some time. This may also affect your offline data from real timings as new changes are made each week/month. To overcome this problem, you should download the latest database regularly. On an average, it is updated once in a month. First of all, open RailTime app. Now click on "Time Table" button. Here type the source & destination station (type few characters or code) and click on search icon. After this, a pop up box will appear. Find and tick mark the correct station you're searching for. Finally choose your date and click on "Find train for the day" or "Find train for the week" button. If you'll click on any of the train, a new window will open and from here, you will find all stations name, their code and arrival time for each station. This is what you are looking for. Am I Right? Huh. 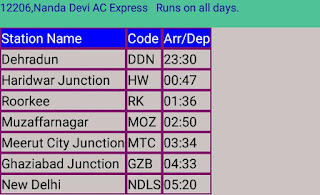 Now find your station name and get all timings info. 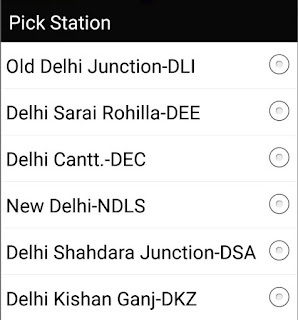 Apart from searching stations, you can also search for train name or number to find its complete time-table. Go and try this yourself. 1. Is this app official? No, this is not an official app. RailTime is not associated with Indian Railways in any way. 2. Is all data accurate? As much as I know, all data is accurate. 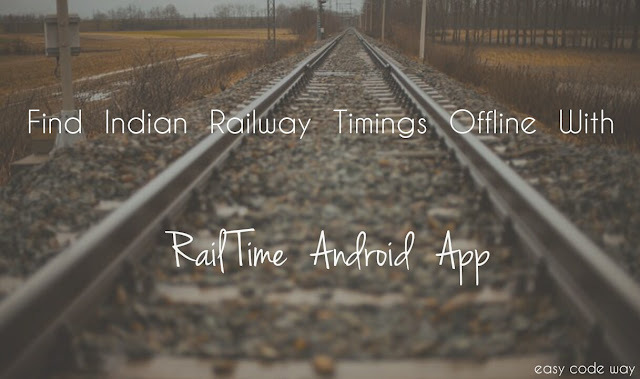 However, few changes are made each time by Indian railways so this may affect your app data. To troubleshoot this problem, you can update the database. 3. How to update database? To update it, simply open RailTime app and click on settings icon. Now check for new updates. If database updates are available then click on "DNLD" and then hit "Yes" button. It will automatically start downloading. For more questions, you can check the app help section or ask me in below comment box. I am always here to help you. Now what are you waiting for? ;Go and enjoy this offline app. How was your experience?